1. Mix sachet of wasabi with water according to pack instructions. 2. Put wasabi, rice vinegar, soy sauce and sugar into a large saucepan. Bring to the boil, stirring. 3. Add the mushrooms and bring slowly back to the boil. Simmer for 7 minutes. 4. Remove mushrooms from the marinade and leave to cool. Reserve marinade. 5. Meanwhile, soak the arame in cool water for 10 minutes. Drain thoroughly. 6. Cut the cucumber in half, lengthways, and remove the seeds. Cut cucumber into thin strips. 7. Heat the oil in a wok and stir-fry the bean sprouts and cucumber for 5 minutes. 8. Stir in the arame and japanese seasoning and stir-fry for a further 3 minutes. Cool. 9. 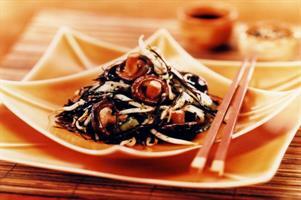 Stir mushrooms into the arame salad and divide between 4 plates. Pour over a little marinade.